TopLine Communications is an award-nominated London-based media relations agency that helps its clients become opinion leaders. We work with companies to ensure their messages reach the correct target audiences via the appropriate traditional and social media channels. Finance, technology and education organisations choose TopLine to help them. 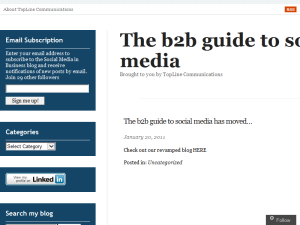 This what your The b2b guide to social media Blog Ad will look like to visitors! Of course you will want to use keywords and ad targeting to get the most out of your ad campaign! So purchase an ad space today before there all gone! If you are the owner of The b2b guide to social media, or someone who enjoys this blog why not upgrade it to a Featured Listing or Permanent Listing?